Yes, folks, it's here and available in the UK right now. You can order from Waterstones or Amazon. Because I get sent these for free I have FIVE signed copies of the UK paperback to give away. All you have to do is to send a good reason why you think you should get one. It can be a short poem, a witty aside, a heart-rending plea or a simple threat of personal violence. The only rule is that it has to be a Twittery 140 characters in length, and that you allow me to post it up on my website. The most amusing/erudite/bizarre will get the book. Hodder territories only. 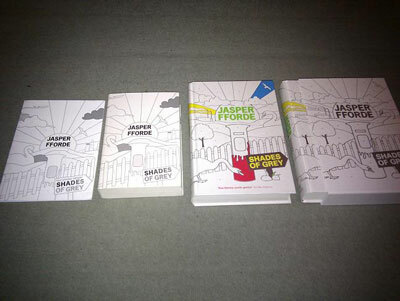 Entries to jasper (at) jasperfforde.com with the subject line 'sleuth'. Please note that no emails are retained or sent on to a third party for any reason. This is all just silly fun. Prizes have no value, no purchase required to enter or find out results. The pleas are in! Those highlighted in RED will be sent a book. Many thanks to all those who took part. Each Day Desires Infect Eddie Rather Unavoidably Sowing Secrets Eventually Told. Just Another Needing Enlightening.Grant Request,End Yearning. There plots too simple and boring. Sarah, read, Shades of Gray. That I soon will be winning. What fun it was to water colour the cover of my copy of SoG! Since my daughter's first Christmas my house has been deluged in bright, univisual, polychromatic plastic. I need Shades of Grey to restore the balance. But there is nothing I love more, than the creases on a paperback spine. I would say I deserve it since my wife is a budding writer and could use the signed copy to inspire her, but really I should because tire with, so nag a ram! I looked on your website only yesterday to see if it was possible to buy signed SoG's, a free one would be even better! Shades of grey wherever I go. Fresh Lawn Green, it no longer flows. Get rid of grey & bring Lincoln to me! Please give the book to our library. It will be the most popular tome in the library and will also make my life complete. Please send me a signed copy of Shades of Grey or expect a weather forecast of sunny with a chance of homicide in your area. There is a woman who can read. She loves Jasper's books oh indeed. I want the free book. Please sir, oh do take heed!" "Outside it's frozen, the world is just grey but bookworld is golden, there's tea on a tray. A page is a cookie and Eddie is cream. A dream!" Because the 'Next' sleuth is going to be so diabolically cunning and cruel, this is my only chance to win and avoid a temporary mental illness. Proofreading 200 pages of incomprehensible rollercoaster philosophy has drained all the colours from my life. "Shades of Grey" would match. I'd love this book but can't buy it as some b@st@rd cleaned out my bank account, no joke! so let me win it. Reports to The Office of Regular Vowels say long a's in Shades of Grey have been replaced with short a's. Please supply a copy for checking. How do I prepare some text before Thursday Next, that will strike a chord, to swindle a book from Fforde? Mammoth steak or mammoth pie, I have but one thing on my mind so give me a ruddy book or on mammoth I will dine. We replied in broken but definitly not online translated Welsh: Ble wyt ti'n eisia fi anfon y llyfr? "I think Fforde is a great writer, a reliable car and an awesome way to cross a river, unless it's tidal." I've red it once, but I'd be tickled pink to win a signed copy of Shades of Grey to drive away the post Christmas blues. I lost my spoon and I'm too afraid to go out of the house and buy a copy. For five lucky Pommies to see. And send a copy to me! I had a pretend wedding to your australian nephew George in an attempt to be related to you. and I'm disabled. O, give me some Shades of Grey! Red Ed cannot take it away. Only Jane can show me the way. Basically I'd like a copy of your book because I'm skint and I absolutely love your books and I need Shades of Grey to my collection or your books. Well they're my books but written by you ... Anyway I'm rambling now so I'll keep my fingers and hope for the best. Books are for reading; yours are not. Yours are to be read and the contents then used to baffle the world. How can I baffle the world with extracts of SoG if I don't have it? Shades of Grey had me blinkin'. For Painting by Numbers, my Lime-y mate! Once upon a time there was a teacher in island who shared her love of all things Ffordian with her middleschoolers. Afterwards they devoured book after book they begged for more, money was tight and the library couldn't rate. So please take the bait and award me and my students the newest and the great Ffordian feat! "You think that you've got enough Shades of Grey in that book? Have you seen today's sky?? The weather pwns your book so I should get a copy!" It's pretty obvious to me that I deserve a signed copy of _Shades of Grey_ simply because I've read it, I loved it, and I have absolutely NO idea whatsoever what the restriction "Hodder territories only" means! If that doesn't qualify me, I don't know what would! Knowing that grey has shades. My life for a spoon. My black-and-white world needs some nuancing. I fear Thursday Next will go truancing. I have the wine, I have the chocolate, I have the soft jazz, now all I need is a good book. 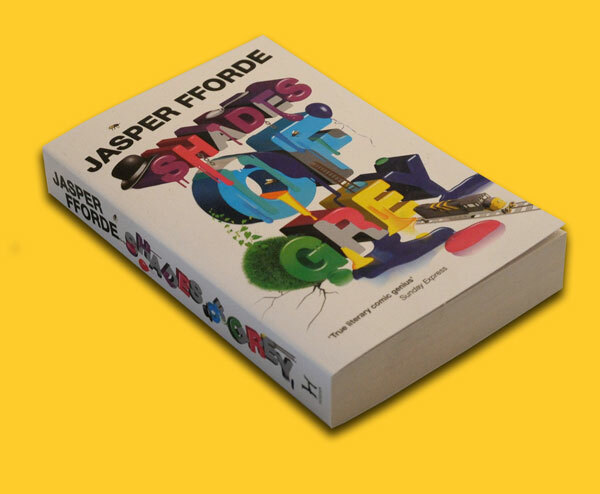 Please send me a copy of your Shades Of Grey! I need a copy as my 19 week old has started to not sleep through the night again and I need something to read to him to get him back off ! We can SO identify with Nick and Partner. Our Stella is nearly six months and still not sleeping..
Or I will leave you pleading! I need Shades of Grey so that I can stop Randolph Spongg from releasing grammarsites into it so that me and UA of W Cat can save Bookworld! Agreed. Entirely my fault. Child support cheque also in post. I have Pickwick as hostage. Send me free signed copy or he get turns into monochromatic Grey or fed to the Yateveo. Give me book - you know its your civic duty! Before the next leepback removes it from history, I'd love a signed copy to put in my valaise. There is no case of boredom and/or illiteracy which cannot be ameloriated by reading SOG. Imagine reading a signed SOG. Boom. Poverty = history. I've run out of firewood and would like to keep warm this winter. New paperbacks burn best. "Im a very lazy identity thief and your signature would really help. Any credit card numbers or future manuscripts also welcome.Signed, A Fan"
Please send me a book or more birds will drop out of the sky. Throw in a t-shirt and I will take one off your hands. US paperback SOG is published on the 8th Feb 2011. You'll be offered freebie copies too. Perhaps. Maybe. We'll see.